The twisted knot construction is built for the toughest wire brushing applications. 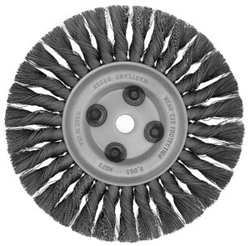 It is designed for cleaning welds, removing scale and cleaning parts where surface preparation is required.. 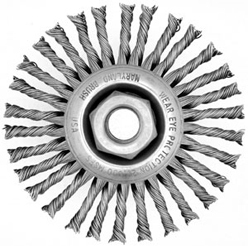 The twisted wire in uniform supported tufts results in high impact brushing action and longer life. These are available in carbon and stainless steel wire. Standard sizes are 4” ,6” and 6-6/78” diameters.